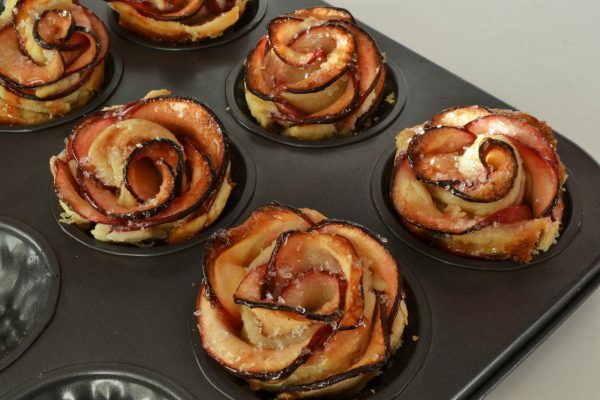 This year, how about surprising your sweetie with a dozen roses… right out of the oven! I’ve cooked up the perfect recipe for you. The pictures say it all! Thaw puff pastry according to package. Slice the apples in half. Peel and core, then cut into very thin slices. Place slices in a bowl, then cover with water and lemon juice. Microwave for 5 minutes until slightly tender, then drain into a colander. Place the thawed pastry on a floured surface. Roll each puff pastry sheet to about ⅛" thickness. Cut into 6 equal portions. Spread butter over the pastry then sprinkle with brown sugar. Place apple slices along the top of edge of dough, overlapping slices slightly. Fold the bottom half of dough up over bottom part of apple slices. Starting from one end, roll dough to form a rose-shaped pastry. Sprinkle with cinnamon-sugar. Transfer roses to cupcake tin. Bake at 375ºF for about 35-40 minutes. Let cool and dust with powdered sugar.